Hello! I am Rick Brack and I am a Christian. I have been a business owner in the construction field for almost 20 years and I really enjoy working with my hands! 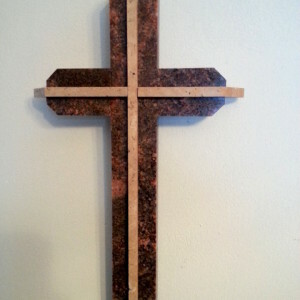 While on a project for a friend, it was he that came up with the idea for me, I could create art from stone or granite. My first thought was to make crosses; from then on my imagination has been exploding with thoughts of designs and styles to create crosses for you. I hope you enjoy my crosses as much as I enjoy making them for you! 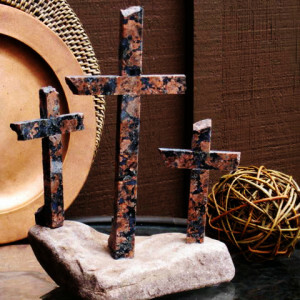 Check with Kelley Gallery frequently as new crosses are continually added in different sizes, colors and material combinations and designs. May God bless you! Hello! I am Rick Brack and am a Christian, and I have been a business owner in the construction field for almost 20 years, and I really enjoy working with my hands! While on a project for a friend, it was he that came up with the idea for me, actually. Maybe I could create art from stone or granite, and there you have it! Stumbling Stone Crosses was born. My first thought was to make crosses. 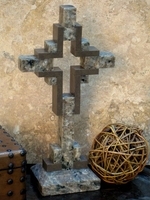 From then on my imagination has been exploding with thoughts of designs and styles to create crosses for you. Family, friends and clients have been very excited about my creations which gave me the courage to market them to others who might feel the same way. I hope you enjoy my crosses as much as I enjoy making them for you! 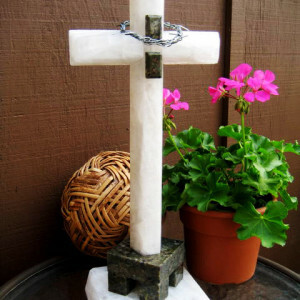 Check with Kelley Gallery frequently as new crosses are continually added in different sizes, colors and material combinations and designs. May God bless you! Hello, I am Janet Brack, Rick's wife. I have been a Christian since 1991. I prayed for a loving, Godly husband with excellent character that was able to talk about the Lord with others in his business. God answered my prayers when I met Rick! I am a creative person in terms of being visual and am good with colors, and decorating within the home. 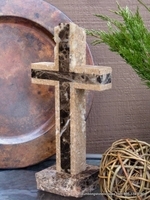 I enjoy it when Rick and I take the pictures of the crosses together, but what I enjoy the most is when we choose the granite and stone from our sources. This is a fun and interesting process since there are usually some pieces of stone that one of us adores and the other just does not “see” it. But when the crosses are made, wow! They come to life and we both love them! I also love coordinating color schemes with Rick for the individual crosses, and both of us have the knack, or should I say God's gift, of visualizing which style cross should be cut from each stone. I am so proud of Rick, my beloved husband! He amazes me with all of the designs he comes up with. I have come up with a few, or I may have some finishing touch ideas, but he runs circles around me in this area. He truly is an artist! 12 inches. Wow, Amazing! … Are the words that come to mind over and over when I look at the artistry in this sandstone Celtic cross. The color patterns are beautiful and the design is truly very interesting. I affectionately say “This is where Celtic meets Frank Lloyd Wright!” Whether you are a desert southwest fan or not, you WILL appreciate this cross! The base is a multi layered geometric creation. The colors are browns, grays and golden brown. 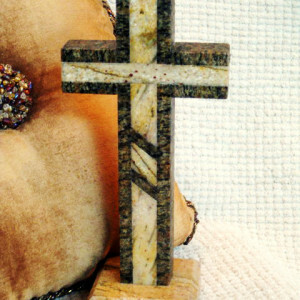 This cross is stunningly viewable from all sides, front and back. 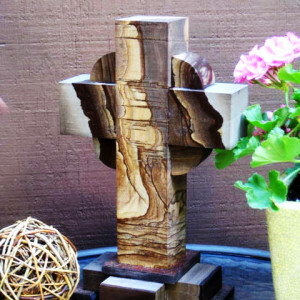 The cross is made from sandstone and there are some parts of the base that are quartzite.